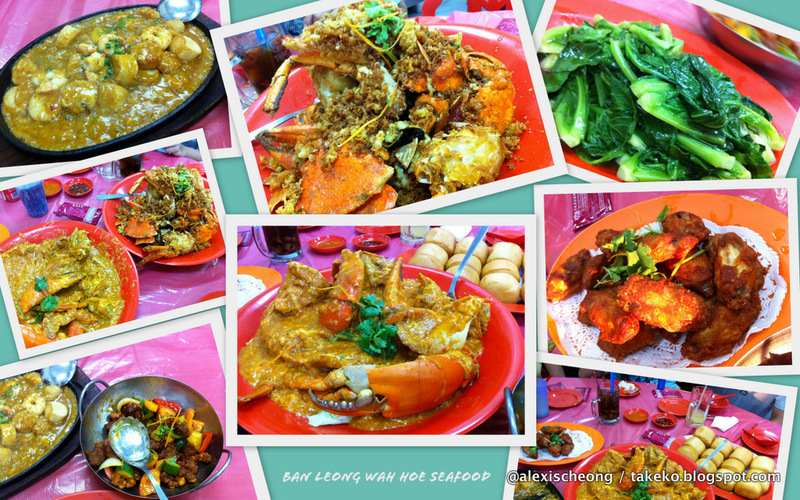 Went for a sumptuous seafood dinner at Casuarina Road on 3rd April, which coincidentally was my birthday. The reason for the dinner was much bigger though, its the first time for a long time that almost everyone could make it for that dinner. It took about 39 comments on a Facebook update by jm to organize, and I must say it is really successful! I can't believe I did not know about the place even though Casuarina is really near my house. This restaurant apparently is an Institution in the zichar industry, having all the right star dishes to be sought by hungry Singaporeans week after week. The mandarin name is 万隆华和海鲜菜馆, and their most famous dish is apparently the Butter Crab. The chili crab looked good too so we ordered that as well. Hence we ordered... The kailan, which is really nice and crunchy. The sweet and sour pork, which is also well done, and the hotplate toufu, also very nice. The prawn paste chicken there is also a signature, and yup! it is really good. Almost or even better than Kok Sen's version at Keong Saik. Hot and crispy does it. Those were the calafares though. The stars of the show were the medium sized butter and chili crabs. They are 38 per kg, so apparently a medium crab is about 3kg. The pincers were HUGE. I had one and it was so juicy and yummy. I don't really know how to eat the rest of a crab, so i only had a little, but the chili crab sauce was super good. We ordered fried mantous to dip them in. Ok i might just have to wipe drool off now. The butter crab is really awesome too. Tastes a bit like cereal prawns with the crunchy bits but the butter just dusts the crab with a buttery goodness that brings out the freshness of the crabmeat. All in all it is a very very satisfactory meal. It was about 24 bucks per person for all that too. Oh except the fact that we ordered a beehoon which took FOREVER to arrive, which by then we were already settling the bill! We told them that was unacceptable and wanted to cancel the dish but they insisted to bill us and packed it into a container for us to take away. That was really not nice of them since it is their fault to take so long to cook. That really soured the experience. Ambience-wise it was also not that good since it was really really crowded and the weather was warm. Noise was loud. If not for the quality of the food I would really try to avoid going there, especially on weekends or special occasions. Perhaps it will be better during a weekday. And damn I got hungry just by blogging this. I hope you are too so I am not alone! Was at Ban Leong Wah Hoe Seafood last night for my hubby's birthday. Everything was fine until the end when my son wanted to eat the sliced fish with black bean sauce and bitter gourd because he found a cooked insect, looked like a bee or whatever. This is so shocking to him that he stopped eating totally. @anon: omg that is horrible! that insect must have flew in while they were cooking. if I am a kid I will be very traumatised too. did you point it out to the people and get them to do something? I must admit, their food is tasty but I don't think their kitchen is that clean.